Buffyfest: Hey Scott! So what Andrew has done to Buffy's mind closely resembles early Dollhouse technology, was that the intention? Scott Allie: Sort of. The Dollhouse angle wasn't in the original plan from Joss, but as we started figuring out how to make the details work with the robot and the mind transference, Dollhouse came to mind. Riffing on Dollhouse seemed to make sense, gave us a short hand, especially with Andrew Chambliss working on the comic, and Cliff drawing it, after he'd drawn the Dollhouse comic. I was able to reference the device from Dollhouse in the script and Cliff already knew what it was. Buffyfest: It’s made clear that homemaker Buffy is not what robot Buffy had planned. Did Andrew create that personality or…? SA: Mm, yeah. More to come on that, but yes. 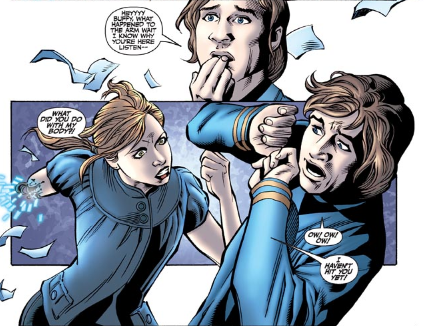 Andrew programmed something to take the place of Buffy's personality. Buffyfest: In the opening pages, there’s a lot of pop culture references littered throughout Andrew’s room (Star Wars, Tranformers, Lady Gaga, Glee.) With Cliff Richard’s penciling, did you leave it to him to come up with what Andrew’s room would look like, or did you and Andrew Chambliss come up with those details? SA: I threw a lot of specifics in there, but Cliff added a lot too. I think I suggested Gaga, and he came up with Glee. I think, anyway. Buffyfest: The zompires have been creeping into the story more and more throughout the season, now especially with Detective Miranda Cheung becoming one. Will they continue to play a major part in the narrative as the story progresses? SA: They'll continue to be important, and involved in some of the turning points of the story, but they're not the whole story. And they're not ultimately the Big Bad. They're relatively minor presence in the next arc, "Guarded", which has Andrew Chambliss and Georges back. They grow more important again in Buffy #14 & 15, where we have guest writers digging a bit more into what's going on with zompires. Buffyfest: Hand on your heart – someone you love is killed and gets sired. What’s harder to deal with emotionally – a vampire or a zompire? SA: I suspect a vampire. A zompire can't manipulate you, it's just a monster. If you knew your child were a monster, and you had to kill it, or even just flee it, that would be unimaginably bad. But if it was talking to you while you were fighting for your life ... worse, I think. Buffyfest: It's nice to see Dawn and Xander again but why is Xander raging so much? He pretty much Hulk-Smashed that tile. SA: He is indeed grumpy. Things have not entirely gone Xander's way. More to come on that. That story comes to a head right before the final arc. Buffyfest: We've noticed a big divide within Buffy fandom where many fans are downright angry at the reveal of Buffy being a robot and never having been pregnant vs. a new legion of fans (mostly on Tumblr) who have responded very positively to the story. What do you think of this anomaly? SA: We expected it. We liked the idea, and felt that others would—but we also knew there'd be some backlash. I've seen criticisms from people thinking that we ruined our own story about abortion by saying she was never pregnant. And that would be true if the abortion, or the pregnancy, were the most important thing about Season 9. I hope that when it's all said and done most people will think it all added up. I have no delusions that everyone would think that. 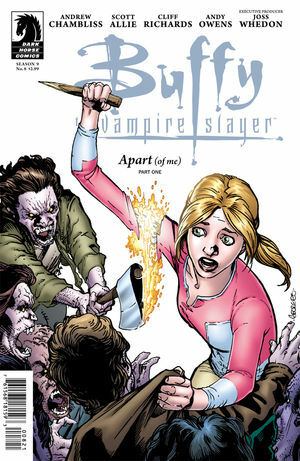 Buffyfest: Why did Dark Horse decided to change the cover of #8? SA: I want to show exciting things on covers. I don't want to ruin stories, but I want to strike a balance. We're not doing our jobs if the covers are boring. So for every cover of Spike and Buffy sipping wine on a couch, there needs to be one where she's getting part of her body chopped off. Every time Georges does cover sketches, he literally does 10 or 12, compared to the 2 or 2.5 that other artists do. When Georges did this sketch, we loved it, and wanted to use it, but you'll notice we actually put it on the issue AFTER the arm gets hacked off. So it was out there, people knew it was coming, but when it happened in issue #7 hopefully it was still somewhat of a surprise. When Georges drew the robot arm being hacked off, we went back and forth about how to show that it was a fake arm. I think the initial sketch had blood. Georges tried a few different ways of drawing the sparks. Then Michelle colored it, and it didn't look right, so Georges tried another way of doing the shoulder. She colored it again, and it looked great. In all that mucking around, we talked a lot about the cover, and came up with the idea to conceal the fact that she was a robot by going back to the bloody shoulder version. So Georges drew a patch, Michelle colored it yet again, and we decided to spoil the arm being torn off, but mislead a little bit by concealing the fact that the arm is mechanical. Buffyfest: The Drusilla mini-series has been shelved but we know you've been planning other minis for Season 9. Do you know who you'll be focusing on having their own mini-series next? SA: I do. 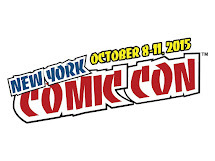 We'll be announcing at Chicago, C2E2. 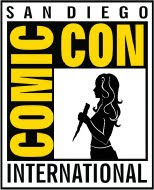 I think word will get out on Thursday, at the retailer presentation, and then in more detail on the Dark Horse panel on Friday. I wish you guys were gonna be there. Buffyfest: Us too! Will that mini-series be moved up now? SA: Actually, yes and no. And I'll tell you guys this. It's two series. One is being moved up slightly, one is not. For a couple reasons—in part because of the scheduling change on Drusilla, and in part because of where and when we need that character doing other stuff in the two main books. While we started with a detailed outline, a lot changed over time. Things changed for the characters in ways we didn't initially predict or understand, and so where each character is, what they're doing, has changed as the story has gone on. Buffyfest: We're definitely looking forward to it! Thanks, Scott. 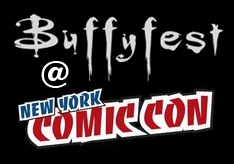 Look out for some extra tidbits about that C2E2 announcement here on Buffyfest this Friday! Let's win thatone for Buffy !